What is the game going to be about? Voxel Tycoon — a tycoon strategy game about transportation, building factories, and mining in a beautiful voxel landscapes. If you like games such as Transport Tycoon (OpenTTD) and Factorio, or modded Minecraft, you should be getting excited. If everything goes well, you’ll be able to expect an early alpha to be released in a few months. We have no final release planned as we’re committed to updating the game with new content and improvements as much as possible. If you can’t follow our social media for any reason, but don’t want to miss the release of the game, you can subscribe to our newsletter which we post on occasionally. How big can maps be? Will there terraforming? The game’s world will be infinite, so you’ll never run out of space, and it won’t just be the world’s surface — you can explore, dig, or even blow up every voxel down to bedrock. Or, form them into a mountain. So yes, it’ll have full featured terraforming. Earlier you mentioned Transport Tycoon. What kind of features will the railways have? If I mess with signaling, will my trains crash or just pass through each other? Trains will brutally crash, resulting in financial and reputation losses. And remember the terraforming part? If your train is carrying some dangerous cargo, you may end up with a few unwanted craters in your landscape (and say goodbye to buildings nearby). What will trains carry? I mean, what about the goods and resources? We’ll have plenty of different resources on our maps — from wood and easily obtainable ores such as coal, to much rarer ones hiding deep underground. 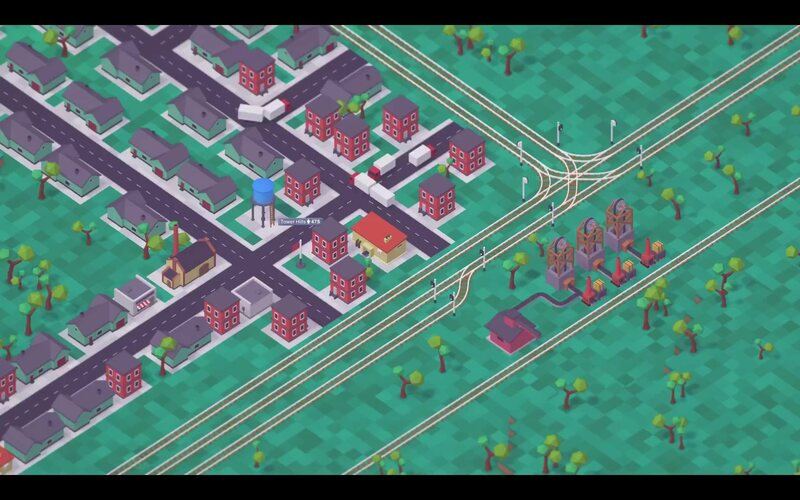 You’ll be able to sell raw resources, but as cities grow, they’ll need goods assembled out of different resources produced in complex factories which you can design and build. Build factories? They won’t be already built, like the industries in Transport Tycoon? We have a different concept for industries. If you’ve ever seen Factorio, or Buildcraft-like mods for Minecraft, you’ll find it familiar. The idea is you’ll build separate devices, such as a furnace or a press, which will have its inputs and outputs. Then you’ll connect them together with conveyor belts and you’ll have your own factory, of your very own design. We feel it keeps the gameplay a lot more interesting. For those who want a pure Transport Tycoon experience, you’ll have a choice of pre built factories already on the map, so it will essentially be the same workflow you see in Transport Tycoon. I saw decoupled railway cars in Greenlight Trailer. Will there be coupling in the game? We definitely want to see railway coupling in the game as well as shunting, but we are still testing it for caveats. Can I only buy preassembled trains in the game or can they also be manufactured? We plan that in the early stages of the game you will rent them. As your finances grow you can also buy trains. And later, you can even manufacture them in your own factories. What other types of transport will there be in the game, besides trains? Trucks, ships, planes, and more planned. Will there be different eras like steam, diesel, electric, maglev etc? What is the year when the game starts? There will be no hard ties to the real epochs, so the player can unlock high-level technologies just based on his progression in the game, not the exact year. In other words, it will be research-based. Will the game feature your favorite feature and when? Please check our detailed Roadmap where you can see what features are planned and when you can expect them to appear. Will modding of the game be supported? Some tools are already available. Yes, there will be Co-Op and versus multiplayer game modes, which we’ll add after the early alpha release. Is it pure sandbox or will it have some kind of quests or a campaign? On launch, there will only be sandbox mode, maybe with some random events. But we’ll be sure you won’t get bored. Thanks to the engine we chose (it’s Unity), the game should run flawlessly on Windows, Mac OS, and Linux. Though we haven’t tested any Linux builds yet, so that’s just in theory for now. Again, our engine supports a huge variety of platforms, but some of them need special treatment in terms of UI and hardware resource management, so - it’s possible, but it’s not on our roadmap at the moment. We are two developers with over 9 years of professional experience, very passionate about tycoons in particular and good games in common. Also, we love stylish and beautiful things. I saw that some people have different colored labels on Discord. What do they mean and how can I get some? First, do not hesitate to tell every train-tycoon-Minecraft-voxel-lover you know about Voxel Tycoon. Also, because English isn’t our native language, you can help us proofread our materials (like this FAQ) and report any mistakes, or even send a Pull Request on GitHub. For those who want to contribute to Voxel Tycoon, or prepare for modding the game before it’s released we’ve offered some of our early authoring tools. I think you’ve done something wrong! Feel free to express your criticism in any convenient way, but please keep in mind that everything you see is very far from a finished experience and we’re constantly working and improving on the game.